Ahoy Matey! Throw the best pirate themed baby shower ever by using some of these creative ideas. Planning a baby shower can be a blast – especially when you have a fun theme, creative inspiration, and a “treasure trove” of possibilities. 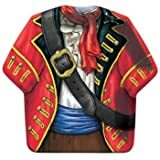 If you’re looking for a unique and adventurous theme for your baby shower, consider a pirate baby shower. Wordplay and bright, fun colors and decorations will really help your baby shower set sail! Another bonus of the pirate themed baby shower is that it is so versatile. If you have a picture of a baby pirate, add a blue eye patch for a wee boy pirate and a pink one for a little girl pirate. Whether the Mom-to-be is having a boy or a girl, pirates work equally well for either gender. This can be really important if the baby’s gender has yet to be revealed, or if Mom wants to keep things gender neutral. Your invitations will not only set the tone for the entire baby shower, your invitations are also the first thing guests will associate with your big party. Before selecting invitations, have a plan in mind. 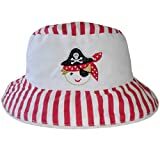 Choose colors and patterns that you can continue through the rest of your pirate baby shower. 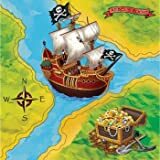 A funky idea is to create treasure map invitations. You can distress the paper so it looks like an old buried map. Draw a simple map to with an “X” marking the location of the baby shower. You can also find cheap baby shower invitations matching your pirate baby shower theme. 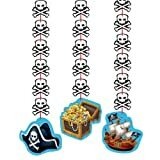 Invitations in the shape of a treasure ship, a treasure map, or with adorable pirate babies gleefully giggling in a pirate landscape are nice. Insert clever sayings underneath the picture, such as “Ahoy Baby ----“ inserting the baby’s last name in the blank space. Have fun with colors and prints – think lush, tropical, and colorful. Go for a deserted treasured island theme to complement your pirate baby shower. Use plain wooden tables and arrange palm trees around the baby shower area. Hang fish nets on the wall and make “coconuts” out of brown and green balloons. Hang fairy lights for a festive feel, and scatter jewels and Mardi Gras beads throughout the area. Serve foods on metal platters. For fun and dramatic pirate baby shower centerpiece decorations, fill a large pirate ship with all kinds of bounty – tropical fruits like pineapples, bananas, and coconuts – and sprinkle in candies and other tempting goodies or make a large ship out of a watermelon (see below). For a great effect, rope more Mardi Gras beads around your ship of plenty. 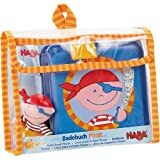 Choose placemats, cups, plates, and tableware in a baby pirate theme that coordinates with your invitations. A guest setting worthy of a captain would be a Zuke Boat. Halve a zucchini lengthways and scoop out the center with a melon baller. Fill scooped-out center with a cream cheese and ranch dressing mixture. Stick matchstick carrots down the prow of your boat to look like oars, and perch paper flags on toothpicks on each end for the ship’s sails. Fun and delish. Foil-wrapped gold chocolate Hershey kisses or coins and goldfish crackers are tasty finger foods that fit your pirate baby shower theme. Fill metallic bowls and halved coconuts for a tropical feel. Serve grilled fruit on skewers. Arrange the skewers so they stand vertical for added height and visual interest. An amazing centerpiece can be created using a watermelon as the base along with long skewers and handmade sails. You could also use chunks of watermelon rind cut in the shapes of sails as well. In either case, that is one fruit bowl your guests will never forget. For grog, have fun with tropical drinks. Think pina coladas, daiquiris, and sparkly spritzers – leaded or virgin. Drink mixes of nonalcoholic versions of many popular alcoholic drinks are readily available. For a tropical punch with kick, try a simple yet tasty colorful punch. Combine two packages of powdered lime drink mix, two cups of sugar, two quarts of water, one 46-ounce can of pineapple juice and mix. Pour over ice cubes in a silver punch bowl. Stir in two liters of ginger ale. For an alcoholic version, substitute a bottle of champagne for a liter of ginger ale. 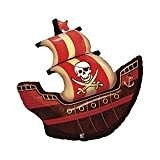 You can purchase cupcake wrappers and cake toppers that match your pirate theme. This gives you flexibility in flavor of cupcake. Just make sure your icing coordinates with the colors of your pirate baby shower. 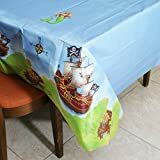 If a cake is more to your taste, bake a cake in the shape of a pirate baby, a pirate ship, or even choose a cake with a tropical island scene piped on the top. Alternatively, you could create cake or brownie pops that are decorated to look like pirate faces. The photo to the right shows an amazing display of pirate cake pops (click on the picture for step by step instructions). 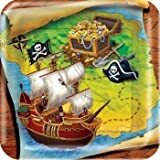 A treasure hunt is always a great option for a pirate baby shower. You could also have guests play Walk the Plank. Blindfold guests and have them walk a 2 by 4 piece of wood. Guests who don’t fall off get a prize! 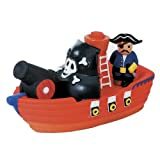 You can also shop online for printable baby shower games that feature a pirate theme. Your guests will be flyin' high when they arrive at an adorable baby shower designed to welcome the new 'lil pilot to the world. For a kicky option, fill net bags with foil-wrapped chocolates that look like gold coins to create treasure pouches to give away as chocolate baby shower favors to your guests. Body butters, candles, lip balm in personalized favor containers that match your pirate baby shower theme are always a hit. 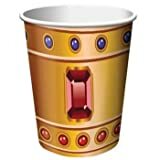 Fill personalized container with gold body dust and body glitter for a real treat, too. 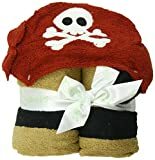 Ask guests to bring pirate and nautical themed baby clothes, toys, or other unique baby shower gifts. 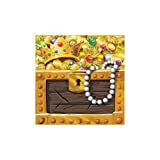 Be sure to have a large wooden chest where guests can place their gifts (or bounty) that Mom and Baby will be sure to treasure! Consider creating a diaper cake with a pirate theme like the one shown to the left. It is fairly easy to do and it can be used as both the centerpiece at the shower and as your personal gift to Mom and baby. Another adorable shower theme that would work for a baby boy or girl. Create a woodland feel at your big party. Just because you are having a party doesn't mean that you need to create waste - check out these baby shower favor ideas that will have less of an impact on the environment. 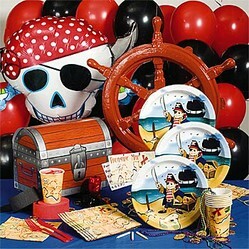 Find all the kinds of cute pirate-themed baby shower stuff including invites and more at All About Gifts & Baskets. 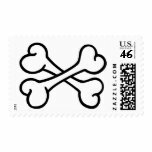 Great for sending out invites or thank you notes! Very cool idea, there are so many of us adults who are big pirate fans, smart baby shower idea, I love it. Very cute ideas here! What a creative baby shower theme! I like it!